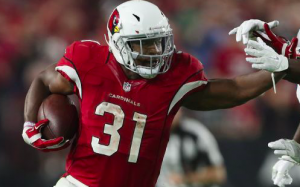 Less than 48 hours after watching running back David Johnson go down with a wrist injury, the Arizona Cardinals have had their worst fears confirmed. Johnson sought a second opinion after initially being diagnosed with a dislocated wrist. Reports Tuesday indicate that the second opinion has confirmed the injury. Johnson is set to undergo surgery on the wrist that will keep him sidelined for at least two or three months. Johnson emerged as one of the NFL’s elite running backs last season, rushing for over 1,200 yards and 16 touchdowns in just his second pro season out of Northern Iowa. He also caught 80 passes for more than 800 yards and four more touchdowns receiving. The Cardinals now plan on placing Johnson on injured reserve. It’s possible that he’ll be able to return later in the season. However, it’s too soon to know how quickly Johnson will recover and rehab following the surgery. Johnson missing the entire season remains a distinct possibility, which would be a huge setback for Arizona’s playoff hopes in 2017. Arizona was expecting Johnson to be the driving force of the team’s offense this season. After his performance last year, quarterback Carson Palmer no longer looks capable of carrying a team on his shoulders. Those suspicions were not the least bit altered by Palmer’s three-interception performance during Sunday’s loss to the Lions. Without a strong running game in support of Palmer, the Cardinals may have trouble competing for a playoff spot. With Johnson out for at least the first half of the season, Kerwynn Williams and Andre Ellington will become Arizona’s feature backs. The undersized Williams is a good change-of-pace back. But he only has 103 carries in this his fourth NFL season. Ellington has had a diminished role in Arizona’s offense the past two seasons. But the Cardinals may need him to become their primary rusher while Johnson is out. Rookie Elijhaa Penny also gives the Cardinals an option in short-yardage situations. For additional depth, the Cardinals have signed D.J. Foster off New England’s practice squad. Arians has not ruled out the possibility of the team re-signing Chris Johnson. The Cardinals released Johnson earlier this month after two seasons in Arizona. He became expendable following the emergence last season of David Johnson. Arians and the Cardinals have done their best to downplay the loss of David Johnson. But there’s no denying that this is a huge hit to Arizona’s playoff chances this season. Even the best-case scenario involves the Cardinals playing at least half the season without one of the most impactful running backs in the NFL. Arizona may have a slew of running backs ready to take Johnson’s carries. But for all intents and purposes, there’s little the Cardinals can do to make up for losing Johnson to a long-term injury.